The combustion of fossil fuels such as coal, oil and natural gas releases significant quantities of carbon dioxide into the atmosphere. Since the industrial revolution the use of these fuels has accelerated. The consequence appears to have been a gradual but accelerating increase in the concentration of carbon dioxide within the earth's atmosphere. 10ppm, from 1940 to 1980 it increased by 32ppm and by 2000 it had increased by a further 30 ppm. By then the total concentration was 369 ppm, an increase of over 30% since 1700. If the increase in carbon dioxide concentration is a direct result of the combustion of fossil fuel then it will continue to rise until that combustion is curbed. Estimates of future concentrations are at best speculative but Table 2.1 includes a range of estimates for both 2050 and 2100. The worst case in Table 2.1 shows concentrations doubling in 100 years. There is a further caveat. While the evidence for a fossil fuel connection with the increase in concentration of carbon dioxide is compelling, the cycling of carbon between the atmosphere, the sea and the biosphere is so complex that it is impossible to be certain how significant the man-made changes are. The atmospheric emissions of carbon from human activities such as the combustion of coal, oil and natural gas amount to a total of around 5.5 Gtonnes each year. While this is an enormous figure, it is tiny compared to the total carbon content in the atmosphere of 750 Gtonnes. This atmospheric carbon is part of the global carbon cycle. There are roughly 2200 Gtonnes of carbon contained in vegetation, soil and other organic material on the earth's surface, 1000 Gtonnes in the ocean surfaces and 38,000 Gtonnes in the deep oceans. The carbon in the atmosphere, primarily in the form of carbon dioxide, is not static. Plants absorb atmospheric carbon dioxide during photosynthesis, using the carbon as a building block for new molecules. Plant and animal respiration on the other hand, part of a natural process of converting fuel into energy, releases carbon dioxide to the atmosphere. As a result there are probably around 60 Gtonnes of carbon cycled between vegetation and the atmosphere each year while a further 100 Gtonnes is cycled between the oceans and the atmosphere by a process of release and reabsorption. Thus the cycling of carbon between the atmosphere and the earth's surface is a complex exchange into which the human contribution from fossil fuel combustion is small. The actual significance of the additional release of carbon dioxide resulting from human activity depends on the interpretation of various scientific observations. The most serious of these relate to a slow increase in temperature at the earth's surface. This has been attributed to the greenhouse effect, whereby carbon dioxide and other gases in the atmosphere allow the sun's radiation to penetrate the atmosphere but prevent heat leaving, in effect acting as a global insulator. If human activity is responsible for global warming, then unless carbon dioxide emissions are controlled and eventually reduced, the temperature rise will continue and probably accelerate. This will lead to a number of major changes to conditions around the globe. The polar ice caps will melt, leading to rises in sea level which will inundate many low lying areas of land. Climate conditions will change. Plants will grow more quickly in a carbon-dioxide-rich atmosphere. Not all scientists agree that changes in our practices can control the global changes. There have been large changes in atmospheric carbon dioxide concentrations in the past, and large temperature swings. It remains plausible that both carbon dioxide concentration changes and global temperature changes are part of a natural cycle and that the human contribution has little influence. It may be impossible to find absolutely conclusive proof to support one argument or the other. But in the meantime conditions will continue to change. And if human activity is responsible, the change may eventually become irreversible. Besides, it is clear that combustion of fossil fuel is creating more carbon dioxide than would naturally have been available. The sound environmental response is to stop this man-made change to global conditions. Fossil fuels are all derived from biomass, from trees and vegetation which grew millions of years ago and subsequently became buried beneath the surface of the earth. Without man's intervention the carbon contained in these materials would have remained buried and removed from the carbon cycle. As a result of human activity they have been returned to the carbon cycle. An immediate cessation of all combustion of fossil fuel would stabilise the situation. That is currently impossible. The popular strategy of switching fuel from coal to gas reduces the amount of carbon dioxide generated but does not eliminate it. One short-term measure would be to capture the carbon dioxide produced by a combustion power station and store, or sequester it in a way that would prevent it ever entering the atmosphere. 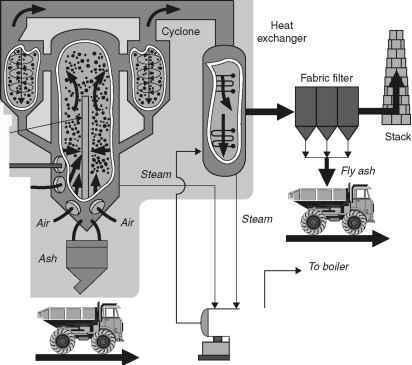 Technologies exist that are capable of capturing the carbon dioxide from the flue gas of a power plant. Finding somewhere to store it poses a more difficult problem. 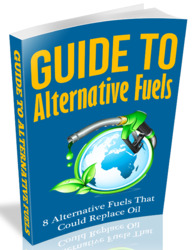 One solution is to pump it into exhausted oil and gas fields. There are other underground strata in which it might be stored. A third possibility is to store it at the bottom of the world's oceans. The enormous pressures found there would solidify the gas and the solid would remain isolated unless disturbed. These solutions are all expensive and none is particularly attractive. However they may become necessary as short-term solutions. Over the longer term the replacement of fossil fuels with either renewable technologies that do not rely on combustion or with biomass generated fuel which releases carbon dioxide when burnt but absorbs it again when it is regrown, will be necessary.